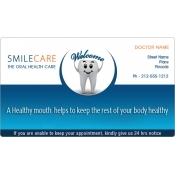 Dental appointment cards or reminder cards are extremely necessary for the functioning of dental and medical offices. These reminder cards aid dentists to remind their clients about their next appointment. Appointment cards are usually the same size of a business card and are very popular in US. However, dentists can maximize their impact by indulging in these dental appointment card magnets. These magnetic appointment cards are usually retained over ferrous surfaces or refrigerator doors. Free ground shipping is offered within the contiguous USA. Dental appointment cards serve as a reminder for patients who may forget their appointments due to social commitments and other job pressures. These promotional magnets serves a double purpose. It can be a business card and a refrigerator art, too. People usually trample an appointment card after using it and they only think about the surgeon or doctor when the need arises. 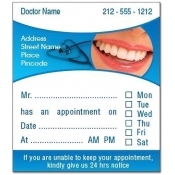 However, these customized dental appointment card magnets offer them reason to retain information of their consulting dentists. Attractively designed, these advertising magnets stand high chances of retention on most visible places at home and at the office. Fortunately, the kitchen is the busiest area in the home and the refrigerator door is the only appliance which is opened at least 11 times a day. People who retain these dental and orthodontist magnets over their refrigerator doors are likely to be reminded of their dentist and its services. This works as word of mouth reference and it will favorably work for the dentist. We offer free full color printing, free art set up, free shipping and free online design proof on all orders. Being attractively priced, most dental and orthodontic clinics find it affordable. They can order it in bulk for tradeshows, medical events, regular consultations and more. Additionally, dental and orthodontic surgeons can mail new dental appointment cards to their clients as a seasonal gift. Whatever be the reason for giving it, most recipients are likely to retain it as a gift of a beautiful relationship that they share with the dentist. Many dental and orthodontic surgeons agree that lively systems such as these help them to strike effective communication with their clients. To know more about customization, shipping and application of our promotional dental appointment card refrigerator magnets, feel free to approach us at info@CMagnets.com or 855-762-4638 (Toll Free).